Roads are closed across the South Island, power is out in many other areas and a Taranaki town has been hit by tornadoes. Follow Radio New Zealand blog for the latest updates. A low is bringing snow to the South, and rain, gales, lightning and tornadoes are hitting the North Island from the west, cutting power to thousands and ripping roofs off homes. In Auckland, boaties are being warned to beware of wind gusts of up to 110 kilometres an hour. 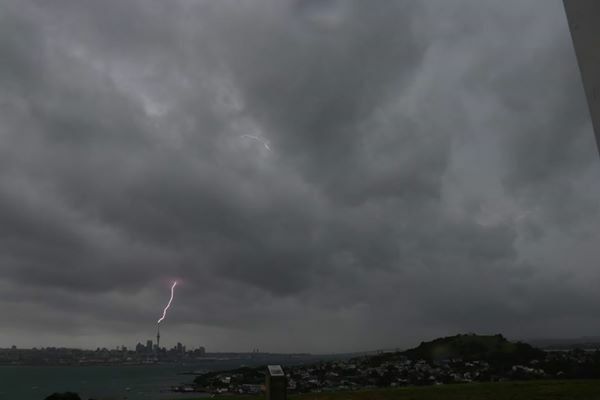 Auckland Civil Defence is telling people to secure loose items in their backyards and balconies and bring pets inside. Earlier, tornadoes were spotted in Opunake and National Park Village, with Civil Defence reporting widespread damage including houses losing roofs. At least nine schools in the area closed for the day due to the weather, and several flights in and out of New Plymouth were cancelled. All Cook Strait ferry crossings have been cancelled for the day. Many parts of the South Island were being hit by heavy falls of snow. Power is out to more than 300 homes in the Buller region of the West Coast. High winds are causing havoc along the coast, with reports of caravans toppling and roofs being lifted. A Buller Electricity spokesperson says about 315 households in Karamea and Little Wanganui have lost power, probably due to fallen trees in the Karamea Bluff area. High winds on the South Island’s west coast are causing campervans and caravans to topple over and roofs to be lifted. The Police say three campervans and one caravan toppled near Hokitika, Mount Hercules, Harihari and Westport this morning due to the high winds. Fire and Emergency Shift Manager Brent Dunn said that crews have responded to about a dozen weather related calls on the West Coast so far today. Mr Dunn said that crews have been tying down roofing iron that have come loose in the Westport, as well as responding to reports of flying trampolines. He said that residents should secure large outdoor items as long as it doesn’t put them in danger. With surface flooding on a number of roads in Taranaki and the Central North Island, as well as trees and power lines down in some areas, Police are working with Fire and Emergency and Civil Defence in affected areas. Motorists are urged to take care and are asked to follow the directions of emergency services and roading contractors in areas with road closures.